Have You Been Charged with a Felony & Don’t Know What To Do Next? At Basiga Law, we focus all our energy on providing aggressive criminal defense to the people of Mid-Michigan. We are extremely passionate about defending the rights of our clients and we will fight just as hard for you. Due to the fact that every criminal case is unique, BLF lawyers will never attempt to fit your case into a “cookie cutter.” We take pride in working with our clients to ensure that they understand all of their options and the possible consequences of each decision they make within the judicial process. If you are scared and feel like you have nowhere to turn, please give us a call. We offer 1 hour of free consultation with no strings attached. Let us ease your mind and help you through this troubling time. If you are facing a felony charge in the state of Michigan, below is a flow chart of the process of being charged with a felony works. The process of a criminal case can be daunting and very confusing. 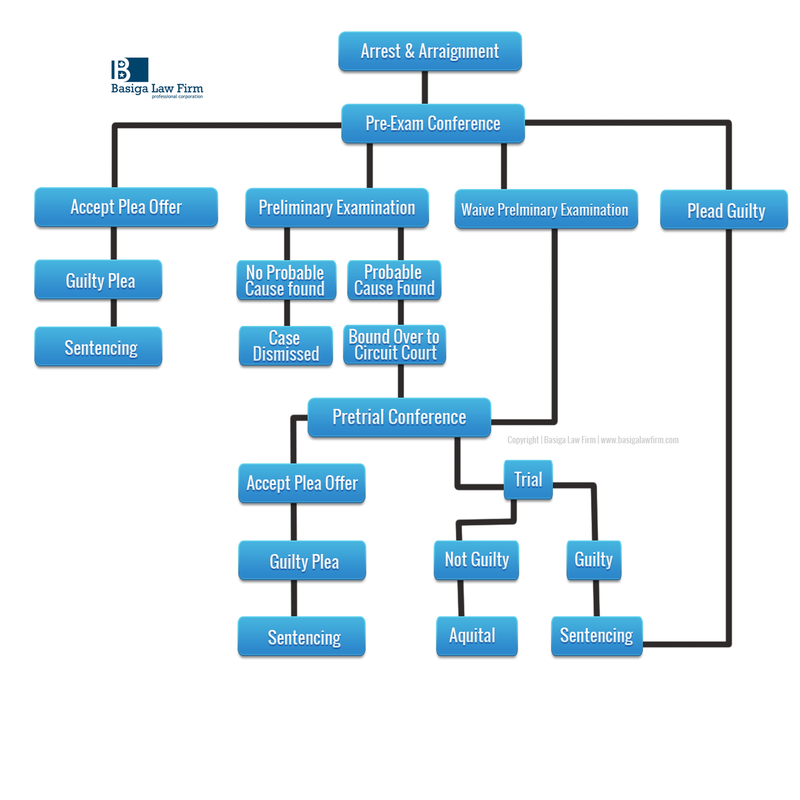 The following flow chart will outline the general procedures and timeline for a standard felony criminal case in Michigan. This is only meant to be a general guide. Each criminal case is unique. Your criminal case must be evaluated by a knowledgeable BLF attorney to determine the process your case will go through.